Before any club embarks on competition, it must have a club vest and with it distinguishable colour(s) and design. 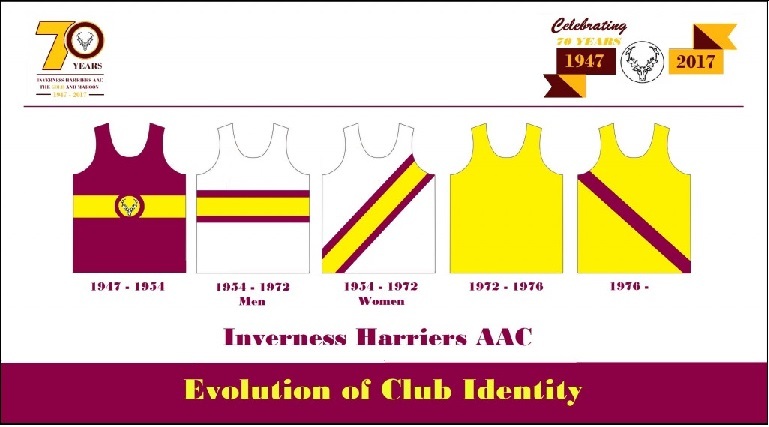 In the club’s first 70 years, Inverness Harriers AAC has had four different designs although the current design has been used for over half that time. 1947-54: The original vest was maroon with a broad horizontal gold band broken by a large club badge comprising the well-known stag’s head which appears to have been the club’s emblem from the start. This may have been influenced by one of the co-founders Tom MacKenzie, since the stag’s head is the emblem of the Clan MacKenzie. 1954-72: During this period, a white vest with a broad gold band and narrow maroon bands on either side was adopted for the men whilst the women initially had a similar diagonal stripe arrangement. However, there was no sign of this variation by the time of the club’s reconstitution in 1969. During the 1970 Annual General Meeting (AGM), it was proposed to revert to a maroon vest but nothing more came of this and the white with maroon and gold horizontals remained for another two years. 1972-76: The third design of an all gold vest was adopted for a short period in the 1970′s, but was soon revised again to incorporate both club colours; gold and maroon. 1976-Present: The current design of a gold vest with maroon diagonal stripe was introduced at 1976 AGM.